When venting through a roof is the best option a quality roof vent should be considered; the roof vent by vent works was designed with a back draft damper to prevent drafting from outdoors, we also included a removable ¼" inch galvanized steel screen. These heavy gauge vents are not available at your local home improvement or general hardware stores. 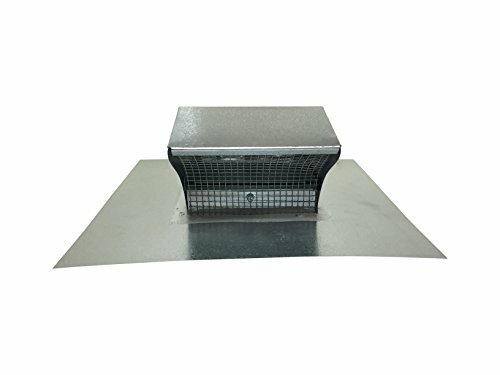 This is a 5 inch diameter roof vent that is constructed of 26 gauge galvanized steel but If you need a different material or size we have other roof vents available on our product page. You can reach the product page by clicking the blue vent works link over the title on this page. There are 2 different material options; galvanized (26 gauge), or aluminum (high grade). There are 5 different sizes 4 inch, 5 inch, 6 inch, 7 inch and 8 inch. Our vents are used in a wide variety of commercial and residential applications including heating systems, bathroom exhaust, kitchen exhaust, laundry room exhaust, venting spray booths, laser engraving machines, exhaust fan blowers and virtually anything else with a round exhaust. To install: cut a hole that is 5-1/8" inch bigger than the duct pipe, then install, be sure to seal it. Not for use as fresh air intake. If you have any questions about this product by Vent Works, contact us by completing and submitting the form below. If you are looking for a specif part number, please include it with your message. Keen Home Smart Vent - 4"x10"